Cymbet™ Corporation is the leader in rechargeable solid-state energy storage technology, embedded energy, backup power, and energy harvesting solutions. We are the first to market high energy density, solid state, long lived, component packaged energy storage devices in high volume for use by the electronics industry. The solid-state energy storage technology incorporated in Cymbet in the EnerChip™ product family was originally conceptualized at Oak Ridge National Laboratory. Cymbet licensed and dramatically improved upon these concepts with the goal to bring new power solutions to the evolving nanotechnology power needs of the electronics industry. The EnerChip solid-state energy devices are made on silicon wafers using semiconductor processes that are the core of Cymbet’s PowerFab™ manufacturing process. The PowerFab process embodies many Cymbet patents and proprietary know-how and enables many of the EnerChip product’s unique attributes. EnerChip energy storage devices created using Cymbet’s PowerFab process are radically different from typical battery devices. An EnerChip wafer is shown below. 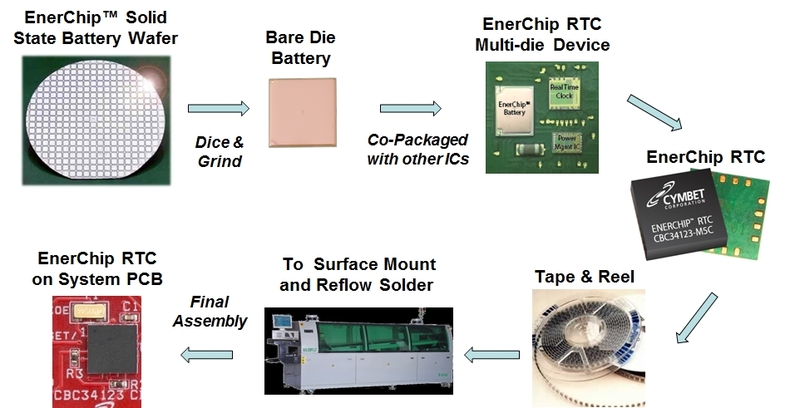 The EnerChip die are diced and then used directly by our customers in Embedded Energy Applications or packaged in standard semiconductor surface mount packages. EnerChip devices in semiconductor packages can be assembled using standard surface mount technologies and reflow soldered to the board. The structure of the EnerChip lithium free current collector is the key enabler to reflow solderability, and is why it is completely safe to transport EnerChip devices in any quantity by aircraft. The flow diagram below illustrates the EnerChip manufacturing process. Tell us about your project, and we’ll recommend the right Cymbet solution for your needs. © 2019 Cymbet | All Rights Reserved.